When do you end the bedtime bath? As a parenting strategy to help your life go smoother, it’s hard to argue with the tried and true strategy of established routines. 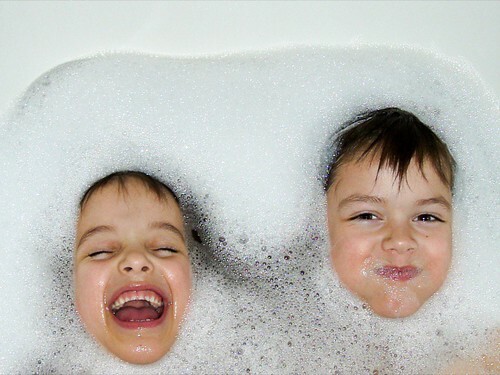 One of the routines we have with our kids is the evening bath, which we use as the transition to bedtime. For my 6 year old daughter, her bedtime routine has consisted of a bath before bed every night (save the very rare occasion) since she was a baby. But lately I have begun to wonder at what age does the bedtime bath stop and can be removed as part of the bedtime routine? An evening bath does serve another purpose other than acting as the starting point in the bedtime routine, which is, of course, hygiene. But the primary reason we (and I suspect most) parents have an evening bath has more to do with routine than cleanliness, and running a bath each and every night is not exactly an environmentally friendly act. So, my question is – at what age do you/did you begin phasing out the evening bath as part of the bedtime routine? This entry was posted in Dad to Dad, Uncategorized. Bookmark the permalink. Harry started phasing out of his bath somewhere in the last year…he'll be 8 in July. It just kind of happened- he prefers to read himself down now, followed up by parental cuddling 'til sleep. I have to remind myself to initiate showers now once in a while. My recent post Technology Baby! During the non-summer months, we do bath every other night with a thorough wash of hands of face on those nights. My 5 year old daughter has a shower on school nights, every other night. She occasionally asks for a bath, but showers are much faster. We still bath my son (19 months) every other night as well In the summer, it becomes a daily necessity for cleanliness reasons. I don't know when this will end. Maybe when my kids start to request a morning one for their own reasons? If morning is easier then I would also say that it could be removed from bedtime routine at anytime. As long as there is "some" type of bedtime routine in place, it doesn't have to have bath as part of it..
My recent post Check Her Out! This is a good question, my son started swimming before he start walking. Not my fault, his mother was taking him at the swimming pool and stay there until I come back from work. Nothing wrong with that, actually I am happy father of athletic baby.